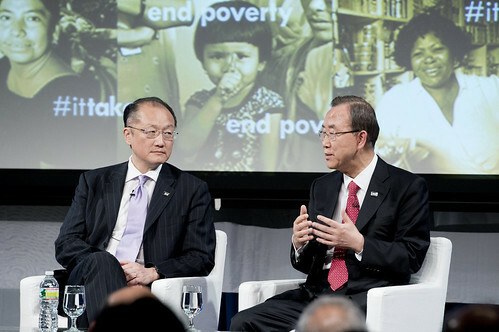 A Data Revolution for the post-2015 Agenda? Last week saw hundreds of people gather for the UN General Assembly debates on the post-2015 agenda. Member states agreed on an outcome document that outlines the process for getting to an agreement. That will still take two years. First, a group of countries comprising the Open Working Group will consider what the agenda should be. They are expected to deliberate until February next year, and then negotiate a text during the summer to present to the 2014 General Assembly. Then, the Secretary-General will be tasked with presenting a draft for member states’ consideration and eventual agreement at the 2015 General Assembly. Much of what happened last week is to be expected from a major UN event. There were side events focusing on specific topics. There was a negotiation over language (the phrase “common but differentiated responsibilities” is included in the outcome document, and in return there was agreement to mention issues like peace and governance). But the biggest surprise was the repeated reference to making sure that the post-2015 agenda is based on evidence. The Secretary-General started this ball rolling by insisting on the important role of science and of academics in the new agenda. But many others echoed the sentiment. One report, Investments to End Poverty, provides independent, reliable, accessible information and data on poverty and resource flows to create an “unstoppable logic” for action. (Disclaimer: I have a working relationship with the authors of this report.) There was a standing-room only side event on improving statistics for development, with the rallying cry of “statisticians unite”. Member states commented on the need for trial and error to move from collective intelligence on development to collective action. The UK announced it would contribute one billion pounds to the Global Fund for Aids, TB and Malaria because of the proven impact of Global Fund programs in saving lives. This focus on evidence, and the growing pressures to link funding to proven impact, could be hugely significant. The High-Level Panel report coined the term “a data revolution”, to draw attention to the pressing need to ensure no one gets left behind as development occurs. But it also serves as a reminder that the quality of the information on which many development interventions are based still leaves much to be desired. Considerable progress has been made, no doubt. And new methods like randomized controlled trials provide solid foundations for understanding what works, while new tools of data collection, like SMS surveys, direct beneficiary feedback and a range of “big data” can revolutionize how we collect data. But there is still a long way to go in understanding the nature and prevalence of poverty around the world and the domestic and external resources that go into addressing it. The data revolution is a call for transparency and accountability. If taken seriously, this could transform development and perhaps be even more significant than the text of the post-2015 agenda that is being negotiated in New York. Great article, data should indeed drive the combat against poverty, after all science has been the most effective way to assess progress in all other domains. Data Collection and Analysis should go simultaneouly. thanks a lot for those insightful blogs about development economics. i feel particularly inclined to read them to sharpen my understanding of economic trends and their bearing on the world as far as changing livelihoods is concerned. Great synthesis, Homi. I am particularly glad that the long-overdue focus on "governance and effective institutions" is beginning to happen. Hopefully this important aspect of development receives the priority it deserves in the Post-2015 Agenda. In your opinion, what would the indicators for strengthened governance and institutions be? One indicator is to have universal birth adn death registration. You can't have effective institutions serving the people if there is no record as to who the people are! It is extraordinary that 50 million children every year are born with no registration and then pass through life with no legal identity. We should start at the beginning and then build indicators for better governance on transparency and access to institutions, anti-corruption, and other aspects of professional and modern institutions. Data, yes. Technology, yes. Transparency, yes. But for whom? Availability does not equal access. How does a “data revolution” work for people who are poor? If we’re not asking that fundamental question, what’s the point? Transparency is still just a first step towards accountability and ownership of aid funding. Unless citizens in developing nations receive comprehensive, timely, and comparable information from donors, they can’t hold their governments accountable, and those governments can’t plan, prioritize, or explain to their populations what they are doing with foreign assistance. Agree to all your points about holding governments to account by making data easy to access. I think the data revolution includes new tools to communicate what the data is saying in easy to understand ways. Check out the visuals in the Development Initiatives report to see what I mean as an example. Citizens of developing countries can easily what their governments are getting and from whom.